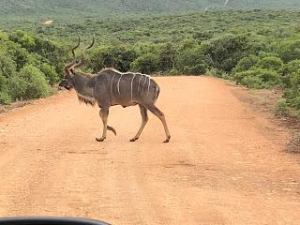 Kudu with long Hooves .... It appears that the hooves have not worn away as would normally happen. This Kudu has unusually long hooves ... Like uncut toe nails. I wonder if anyone has an explanation or has encountered this before? One theory is that owing to some form of injury / damage the animal is walking on the rear of its hooves so reducing the natural wear and allowing them to grow abnormally. I suppose this then becomes a vicious circle.